Watch this discus throw champion unwind his body prior to the release of the discuss. 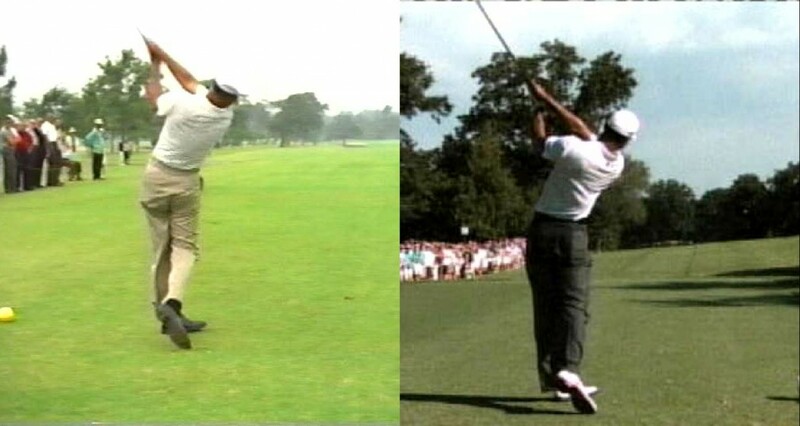 In order to get his front right side moving through to the release, he uses the opposite left and rear side of his body as a “force couple” to create maximum rotational torque of this body. Notice Hogan and Tiger below. They actively connect their upper left scapula and left glute to the heel portion of their lower right foot. As they do this, it promotes a powerful rotational complement springing from the rear portion of the body. Notice how the right arm releases upward and the back of the right wrist releases flat. Isn’t it remarkable how similar these two greats look at this point in there finish? Also notice how theirright foot stays angled at near 50-60 degrees. This is necessary to mosteffectively “connect” the rear portion of the body. If the right footwere to “flop” over past 90 degrees, the left side wouldhave far greater difficulty connecting with a lower right heel that was runningaway from it. 2007 – What a Year for Tiger!